Slightly larger than my 3" Round Nantucket Basket, but still considered a true miniature Nantucket basket, this 4" Open Round Nantucket Basket features a turned ash wood base, (also available in Cherry or Oak), hand-tapered and beveled cane staves, fine cane weaving and a Nantucket Basket cherry wood swing handle attached with bone knobs and washers. Traditional steam bent rattan basketry rims, which just like my larger baskets, feature single cane lashing and brass nailed rims. For those with limited space, this is a nice size basket to add to your Nantucket basket collection. Quality Nantucket craftsmanship and fine details like the additional piece of cane under the rims to give this Nantucket basket a refined and finished look. 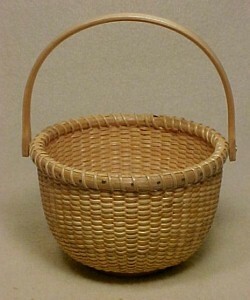 This Nantucket Basket measures 4.5" diameter, 3" high at rims and 5.75" high at handle. Signed and dated on the base. Although I am no longer accepting orders for the Nantucket Basket 4" Round, I do craft one or two of these per year. When available for sale, you can purchase it directly from my Simply Baskets website.